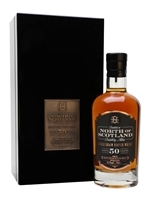 Introducing the first and only official bottling from the North of Scotland Distillery Co, Alloa: a single-grain Scotch whisky aged in bourbon casks for more than 50 years. North of Scotland Distillery started producing whisky in 1957 and closed in 1980. This is a rare chance to taste long-aged whisky from this lost distillery and experience a slice of history.